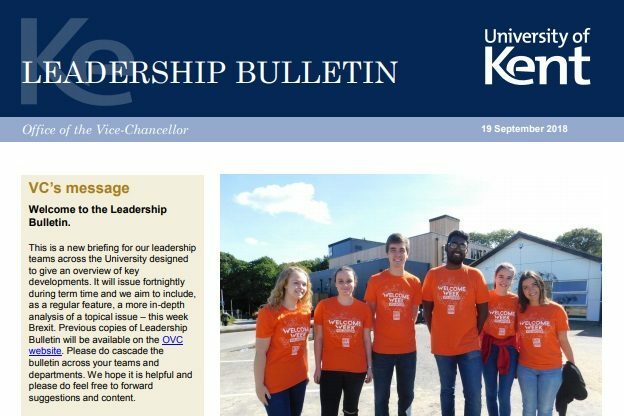 The University has launched a new Leadership Bulletin designed to give an overview of key developments. The Bulletin is distributed to all members of the Leadership Forum to cascade to staff in schools and professional service departments. If you haven’t received your copy yet, you can read the bulletin online . The latest issue contains a message on the strategy refresh from the Vice-Chancellor. Senate has now agreed the draft of ‘Kent 2025’ should be submitted to Council on 5 October for discussion and approval. Senate also took note of the emerging sub-strategies on Education, Research and Innovation and Engagement and our Civic Mission. Copies of all these papers are available on the Strategy Refresh pages. In addition, the Bulletin also includes an update on Executive Group meetings including a discussion by the Extended Executive Group on our recruitment position which is significantly lower than anticipated. Work is currently underway to assess the subsequent impact on the University’s budget. Once the situation becomes clearer, we will let staff know and also update the Finance 2018/19 budget FAQs which have been developed to help explain our current budget position. If you have any enquiries about the new publication, please contact Megan Wells, Policy Officer in the Office of the Vice-Chancellor – M.M.Wells@kent.ac.uk. This entry was posted in Campus online on 21 September 2018 by Miles Banbery.